The fourth in our series of posts which illustrate how libraries contribute to a wide range of outcomes. Following literacy, culture, and communities, this week it’s about the role of libraries in supporting economic growth and the businesses that exist in their area. The prosperity of an area is crucial for residents’ wellbeing and quality of life. Everyone should have the opportunity to participate in and benefit from this. Libraries support businesses to start up and grow by providing information, expertise and guidance and working with local economic development organisations to signpost businesses to sources of support and advice. They can also help attract businesses into an area and keep them there, by contributing to ‘placemaking’ and overall quality of life. 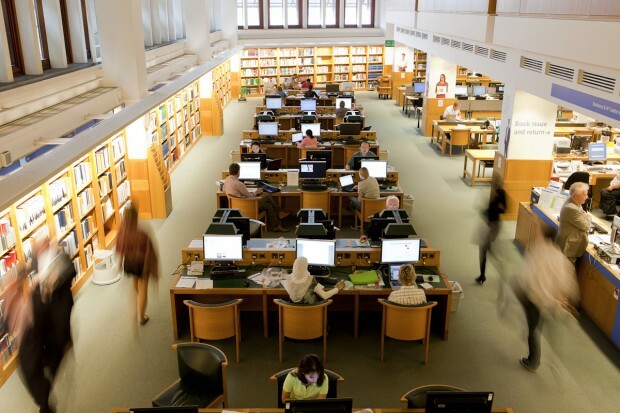 As well as supporting businesses and increasing their productivity, libraries help individuals into work. They run job clubs, back to work programmes and facilitated sessions with partner agencies such as Adult Learning and Skills, Jobcentre Plus and local organisations. They also provide training and support for digital skills and lifelong learning to prepare people for successful and productive careers. A 2013 survey by the UK Commission for Employment and Skills showed that 3 in 10 job vacancies were hard to fill because of shortages in suitable skilled, qualified and/or experienced workers. Increasingly knowledge is becoming a driver of productivity and economic growth. Library workers help people understand and become part of the knowledge economy, to boost business competitiveness locally and nationally. The British Library Business & IP Centre was inspired by a visit to New York’s Science, Industry and Business Library back in 2003. In a blog post for us last year, Isabel Oswell, Head of Business Audiences at the British Library reflected on how your library card could be your passport to business success. She wrote about the Centre in the British Library’s main building near Kings Cross which is celebrating its 10th birthday this year. Building on this successful blueprint, their ambition is to open 20 Business & IP Centres in city libraries across the UK by 2020. So far, they have supported libraries to open Centres in Birmingham, Manchester, Liverpool, Newcastle, Leeds and Sheffield with centres in Exeter and Northampton due to launch in the coming months. Hull and Norfolk have also joined the Network as pilot Centres this year. We published a case study on the origins of this project which includes information on their success so far, supporting the creation of over 1700 businesses and 4200 jobs over a 2 year period. The British Library has produced an infographic which illustrates elements of their activity and success. Click on the caption of the image below to see the full size version. This National Network provides entrepreneurs and SMEs across the UK with free access to databases, market research, journals, directories and reports worth thousands of pounds. There is a programme of free and low-cost events and workshops on a range of topics including business planning, marketing and intellectual property. Friendly staff and business experts are here to help businesses start and grow their business. Beyond the Business and IP Centre Network, there are a lots of other initiatives which seek to provide business information and support businesses. We published a case study about Business Line - a business information service in Wales. Another initiative that has been running in some of the larger libraries in England is Google Digital Garages. 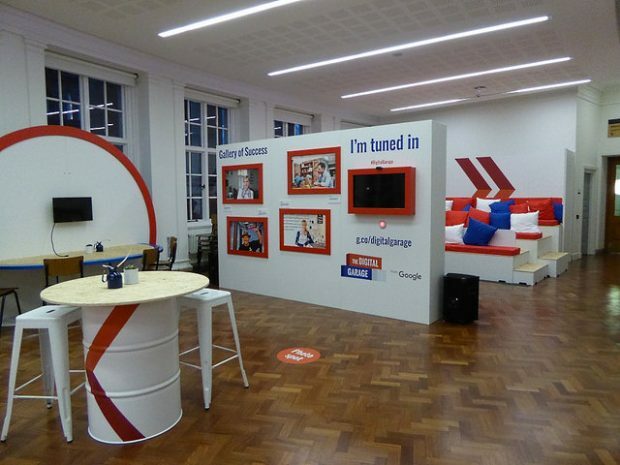 They have been set up in Birmingham, Manchester and Newcastle, and in slightly smaller libraries such as Carlisle, the teams have run a series of Google Digital Garage events. We hope to share more about the experiences of libraries who have run these in a future post. And of course libraries offer more than information. They can also offer space and the opportunity to network. An initiative that is going from strength to strength is the Workary, developed by an entrepreneur who was looking for some workspace for his own business. He started with one location in Wimbledon Library - known as Wimbletech - working in partnership with Merton Council, and now, under the wider Workary brand, they are spreading across the country. Wimbletech CIC Founder David Fletcher sees a perfect fit between their aims and libraries - here he is discussing with Nicky Campbell why UK public libraries matter. If you are interested in exploring the potential for a Workary in your library, you can send in an expression of interest here. We’ll publish a further blog on Workary’s in libraries soon. For the past two years, the UK small business network, Enterprise Nation, has hosted a monthly StartUp Saturday workshop at BIPC in London and across the UK network, forming over 1,000 new businesses in the process. The company delivers affordable and flexible online support, offering a light touch business support model for libraries looking to harness their local small business community and has become the go-to place for digital and entrepreneurial training. Libraries also offer support to individuals - whether it is people looking to start up their own business, or trying to find ways back into work. They run CV clinics or advice sessions - often in partnership with organisations like the Worker Education Association. We wrote about the service Gateshead libraries have developed to help job seekers in this case study, which also describes the partnership they have created with a local games company, to inspire young people and encourage them to consider careers in that industry. Later this week we’ll publish a case study which looks at a partnership in Solihull which aims to help job seekers. Then later this month, we’ll publish a report on the Public and Mobile Libraries Group annual conference, whose theme this year is "Libraries Pay: Public Libraries Supporting Economic Prosperity". Later this week we’ll share how libraries contribute to improved digital access and literacy.